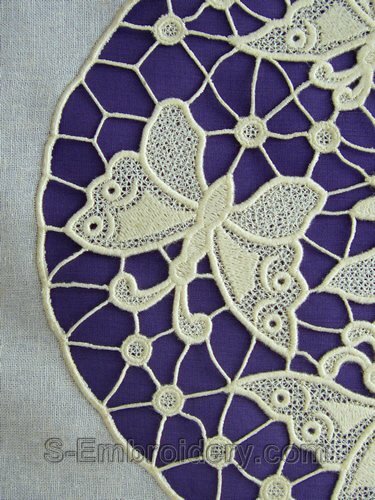 With this machine embroidery set of 10 freestanding lace butterflies you will create a delicate lace decoration for a table cloth, pillow, etc. The free standing lace ellipse measures approximately 15.75 x 11 inches (40 x 28 cm). Each of the 10 parts will fit in 5x7 (130 x 180) or larger hoop. The largest butterfly is 4.93 x 6.79 inches (125.3 x 172.7 mm) and has 23,121 stitches. The total number of stitches in all 10 parts is around 183,000. 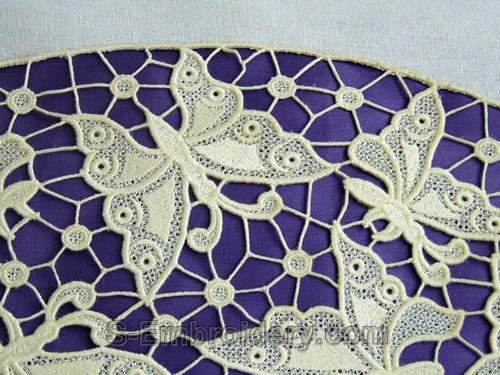 This freestanding lace butterfly ellipse was designed using the "assemble as you stitch" technique. This means that the parts of the ellipse are connected to each other in the hoop in the process of stitching the lace out. 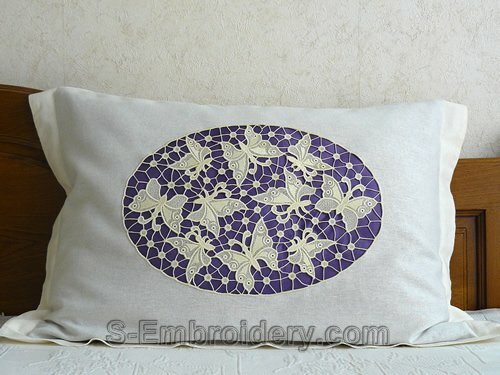 This allows for creating a high quality embroidery with no visible seams between the elements. 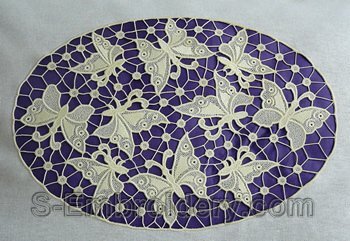 When done properly, the lace ellipse would look like it was stitched out in one piece. The design comes with step-by-step instructions in PDF format. You could get an idea of the procedures involved from the tutorial for a similar free standing lace embroidery project we made available on line. Important notes: In order to do this one properly and get good results the lace MUST be very well stabilized. So, you will need high quality water-soluble stabilizer. 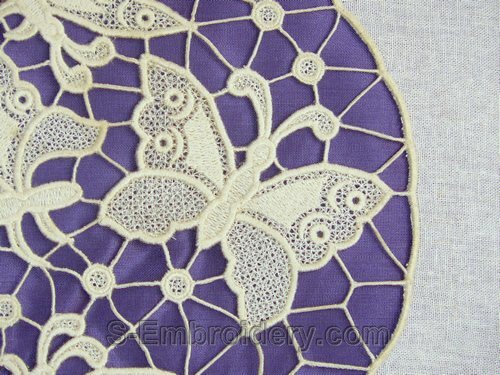 The free standing lace butterfly ellipse featured on this page was created using Vilene D104 which is thicker and fabric-like and we would recommend using stabilizer of this type. Thinner plastic-like stabilizer used in more layers may also do the job but we would recommend that you should first test its performance. In the process of creating this design you will also need adhesive spray or glue stick to attach pieces of stabilizer to each other. You will want to make sure that the glue you'll be using will be able to reliably stick together pieces of the stabilizer you have, that it will not damage the stabilizer and that the glue is water-soluble, so that it could be washed away.